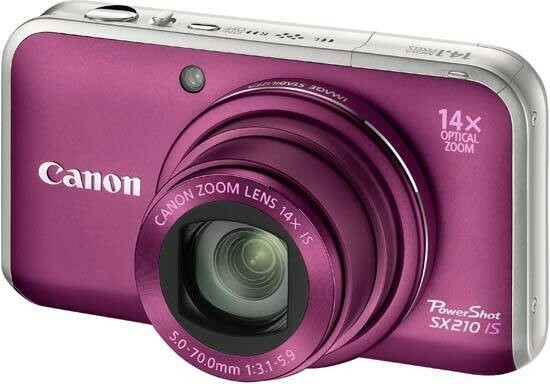 Reviews of the Canon PowerShot SX210 IS from around the web. The SX210 IS is of course the replacement for last year's SX200 IS, Canon's first real stab at the long-zoom compact market. Although it had all the right features it lacked the build quality to compete with Panasonic's market-leading TZ7, so this year Canon has made several improvements, not least of which is a sleek new all-metal body available in a bronze, pink or black. The camera measures 105.8 x 59.3 x 31.9 mm and weighs 215g loaded, making it about a millimetre slimmer and a massive three grams lighter than the TZ10. The SX210 still features the novelty pop-up, pop-down flash of the SX200 and it still gets in the way until you get used to it.